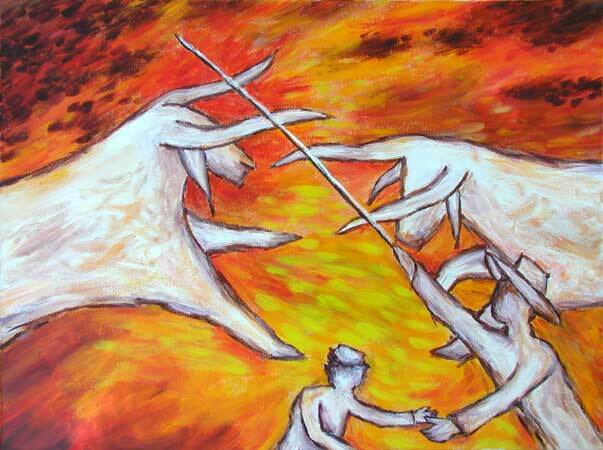 “My Father and the Bulls II” contemporary figurative painting. acrylic on canvas 24 in x 18 in. There is an image in my head straight from the great hunts of the stone age, but this actually happened in the early 1970’s in Mississippi. When I was six maybe seven, my father and I were fishing in this bar pit behind the levee. Bar pits are holes or ponds in the pasture land between the levee and the River. Fish of all types would get trapped in the pits when the water went down after the spring rise, so the fishing there in the summer months could be quite good, especially when the bar pits started to dry out. The banks of this particular bar pit were steep, so we leaned back on the dirt as we fished. It was a nice summer day, and were having pretty good luck with the bream, even a few croppie, for about an hour or so. Then we heard something crashing through the weeds behind us. Suddenly two white brahma bulls came sailing over our heads and splashed into the muddy water directly in front of us. They were young and in rut and fighting like mad, snorting and kicking, without paying any attention to us. In the scramble back up the bank, they kicked a dirt clod in my eye and almost trampled me. Instantly Daddy jumped up with his fishing pole and was whipping the bulls as they jumped and kicked. He was mad as hell, absolutely fearless. I saw it in his face. Later in the truck when we were driving home, all he said was, “Boy, don’t be telling your momma about this.” Then he was silent like usual, and I fell asleep to the sound of the tires bouncing down the gravel road. I noticed something in the year after I first wrote this story down, particularly the way women seem to react to it. Several women, including my wife and my mother, made comments that they thought this incident was some sort of traumatic experience for me, or that I was trying to say something about poor parenting, etc. Nothing could be farther from the truth. I had watched my father jump in front of a freight train just to get me out of harm’s way, and I had seen the anger in his face when he couldn’t do it fast enough. I had seen the pole whipping across the backs of the bulls and the way he leapt at them and the way the back hooves of one bull shot past his shin, missing only by inches. The incident had only lasted a few seconds, but it had all the sudden violence and drama of the crash of the Hindenburg. I don’t think the intensity of the image has ever faded in my mind: my father whipping two angry bulls with a cane fishing pole. I don’t think there could be any hero in the movies more larger-than-life. Of course my father never talked about what happened. In fact, I don’t think he ever mentioned it again. But why would he? He had grown up tenant farming in Mississippi. I’m sure he had seen fingers and limbs torn off by tractors and that sort of thing, and what was there to talk about anyway? What could he have said that he hadn’t done already? Of course I will be painting other versions of this scene.